09 Apr 2014 / 21:38 H.
SEREMBAN: The Muslim relative of a six-year-old Hindu boy, handed over to his mother by the High Court here on Monday after a protracted custody tussle, is believed to have kidnapped the child from his house in Jelebu early today. The alleged abduction came two days after the High Court here granted S. Deepa custody of her son, Mithran, and nine-year-old daughter, Sharmila. In the 9am incident, the 30-year-old Deepa was preparing breakfast for her children when the man allegedly walked through the main gate and called out to Mithran. 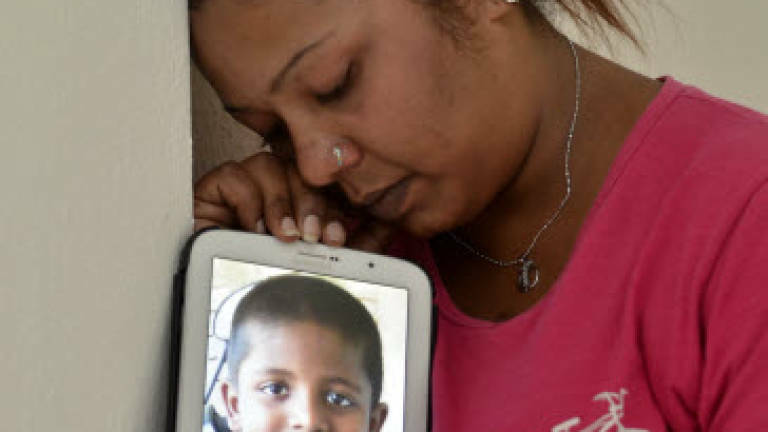 "The next thing I knew, he had taken Mithran and run to a green (Mitshubishi) Pajero driven by another person," Deepa said, adding that Mithran was screaming as he was forcibly taken into the vehicle. Deepa gave chase but fell when the man allegedly pushed her away. "He also took my mobile phone during the commotion," Deepa told theSun in an interview at the Seremban police headquarters today a couple of hours after lodging a report on the abduction at the Jelebu police station. Deepa is concerned about Mithran's safety as she had repeatedly called the man's mobile phone but he did not answer her calls. "I hope Mithran is safe and will be returned to me," she said, adding that she was also worried about Sharmila's safety. On Monday, the court granted custody of the two children, who were converted to Islam by their father, Izwan Abdullah, to Deepa besides also allowing her application to dissolve their civil marriage. WAO social worker Umadevi Rajah Denram, who accompanied Deepa to lodge the police report, said the man's actions were in violation of the court order. She hoped action will be taken against the man over the abduction. Jelebu police, meanwhile, confirmed receiving Deepa's report, adding that a hunt had been launched the man. "We are yet to make any arrest or find the boy but we are trying to trace the man and boy. The man had allegedly gone to Deepa's house on the pretext of visiting the boy before fleeing with him. Our initial findings show that he had acted alone," he said. Meanwhile, Jelebu police chief DSP Setapa Yusoff said Deepa had lodged a report on the matter against her ex-husband Iswan, and that efforts were being made to trace him. He said police are investigating the case for breach of a court order restraining him from meeting his wife under Section 8 of the Domestic Violence Act. He said Izwan had custodial rights over the child under syariah law as a syariah court had granted him custody over Mithran last year. "This is a complicated case. The mother was awarded child custody over the child by a civil court while the father, being a Muslim, has the same custodial rights under the syariah court. The police recognise both laws.We will have to examine the case when we find Izwan but it appears we can only advise them on the matter," he said. Setapa said the complainant alleged in her report that Izwan had gone to her house on the pretext of visiting the boy before fleeing with the Mithran. He said initial findings show that he had acted alone. Setapa also said that both parties had lodged scores of police reports on the matter in the past.